The KIN Consortium features "Algorithim Trading and Artificial Demand"
The prices of currencies, commodities, and equities must be set by fundamental analysis. Criteria such as supply, demand, quality of the underlying asset must be the issues at the core of the price discovery process. The allures of �Computerized Trading� such as liquidity and volume are destroying the fabric of capitalism by creating a centrally controlled market place. Lets look at the market manipulation through the analysis of the patterns of the three different indices. The Dow Jones is comprised of 30 stocks, the S&P 500 is comprised of five hundred stocks, and the Nasdaq is comprised of literally thousands of stocks. EACH OF THESE DIFFERENT INDICES IS COMPRISED OF DIFFERENT EQUITIES, YET THE PRICES ARE MOVING IN THE SAME PATTERN. THE QUESTION IS WHERE IS THE FAIR MARKET VALUE OF THE UNDERLYING EQUITIES? What do you do when fundamental analysis and research reports don't make sense? Today�s market in September of 2010 is full of volatility for a variety of reasons. Lets focus on Algorithmic Trading and the concept of Artificial Demand. The fact of the matter is the international markets have experienced a dramatic increase in volume over the last decade. The volume is not due to an increase in the number of actual investors in the market. The fact is the "NEW NORMAL" is leveraged computer programs that are driving prices up and down. Lets take a look at the charts to witness some of the volatility. Apparently the world is using computers and algorithms to execute transactions in seconds. The machines can be programmed to watch a variety of variables like money flows, technical charts, economic indicators, earnings reports,etc. They are currently responsible for 75% of the volume in the financial markets. This fact has us very concerned about lack of human control over this automated system. The fundamental question comes back to VALUATION MODELS and FAIR MARKET VALUE. 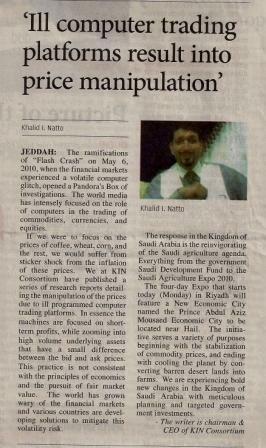 Saudi Agriculture Expo 2010 https://docs.google.com/viewer?url=http://www.us-sabc.org/files/public/Saudi_Agriculture_2010_Brochure.pdf"
When the markets rise and fall based on computerised trades, where are the checks and balances for price discovery and fair market value? This current trend takes us away from free market principles and it leads us towards centralized or politicized markets. The Politicians and their special interest constituency are funnelling subsidies at projects with no natural market demand; thus, creating Artificial Demand in the market place. Then they attempt to resell the project in the financial markets relying on automated computer programs as oppose to convincing investors. These trading programs can be categorized as liquidity rebate traders, predatory algorithmic traders, automated market makers, and program traders. They are exploiting the new market dynamics and negatively affecting real investors. To attract volume, all market centers (the exchanges and the ECNs) now offer rebates of about � penny a share to broker dealers who post orders. It can be a buy or sell order, as long as it is offering to do something on the exchange or ECN in question. If the order is filled, the market center pays the broker dealer a rebate and charges a larger amount to the broker dealer who took liquidity away from the market. This has led to trading strategies solely designed to obtain the liquidity rebate. In this case, our institutional investor is willing to buy shares in a price range of $20.00 to $20.05. The algo gets hit, and buys 100 shares at $20.00. Next, it shows it wants to buy 500 shares. It gets hit on that, and buys 500 more shares. Based on that information, a rebate trading computer program can spot the institution as having an algo order. Then, the rebate trading computer goes ahead of the algo by a penny, placing a bid to buy 100 shares at $20.01. Whoever had been selling to the institutional investor at $20.00 is likely to sell to the rebate trading computer at $20.01. That happens, and the rebate trading computer is now long 100 shares at $20.01 and has collected a rebate of � penny a share. Then, the computer immediately turns around and offers to sell its 100 shares at $20.01. Chances are that the institutional algo will take them. The rebate trading computer makes no money on the shares, but collects another � penny for making the second offer. Net, net, the rebate trading computer makes a � penny per share, and has caused the institutional investor to pay a penny higher per share. More than half of all institutional algo orders are �pegged� to the National Best Bid or Offer (NBBO). The problem is, if one trader jumps ahead of another in price, it can cause a second trader to go along side of the first one. Very quickly, every algo trading order in a given stock is following each other up or down (or down and up), creating huge, whip like price movements on relatively little volume. This has led to the development of predatory algo trading strategies. These strategies are designed to cause institutional algo orders to buy or sell shares at prices higher or lower than where the stock had been trading, creating a situation where the predatory algo can lock in a profit from the artificial increase or decrease in the price. To illustrate, let�s use an institutional algo order pegged to the NBBO with discretion to pay up to $20.10. First, the predatory algo uses methods similar to the liquidity rebate trader to spot this as an institutional algo order. Next, with a bid of $20.01, the predatory algo goes on the attack. The institutional algo immediately goes to $20.01. Then, the predatory algo goes $20.02, and the institutional algo follows. In similar fashion, the predatory algo runs up the institutional algo to its $20.10 limit. At that point, the predatory algo sells the stock short at $20.10 to the institutional algo, knowing it is highly likely that the price of the stock will fall. When it does, the predatory algo covers. This is how a stock can move 10 or 15 cents on a handful of 100 or 500 share trades. Automated market maker (AMM) firms run trading programs that provide liquidity to the NYSE, NASDAQ and ECNs. AMMs are supposed to function like computerized specialists or market makers, stepping in to provide inside buy and sells, to make it easier for retail and institutional investors to trade. AMMs, however, often work counter to real investors. AMMs have the ability to �ping� stocks to identify reserve book orders. In pinging, an AMM issues an order ultra fast, and if nothing happens, it cancels it. But if it is successful, the AMM learns a tremendous amount of hidden information that it can use to its advantage. To show how this works, this time our institutional trader has input discretion into the algo to buy shares up to $20.03, but nobody in the outside world knows that. First, the AMM spots the institution as an algo order. Next, the AMM starts to ping the algo. The AMM offers 100 shares at $20.05. Nothing happens, and it immediately cancels. It offers $20.04. Nothing happens, and it immediately cancels. Then it offers $20.03 � and the institutional algo buys. Now, the AMM knows it has found a reserve book buyer willing to pay up to $20.03. The AMM quickly goes back to a penny above the institution�s original $20.00 bid, buys more shares at $20.01 before the institutional algo can, and then sell those shares to the institution at $20.03. Program traders buy or sell small quantities of a large number of stocks at the same time, to trigger NBBO or discretionary algo orders, so as to quickly juice a market already moving up or down into a major drop or spike up. Because so many algo orders are pegged and are being pushed around by other high frequency traders, program traders are like a fuse. When they light it, that�s when things get really going. This is especially so in volatile markets when things are very shaky and people are very nervous like they are now. Keep in mind that many algo orders must achieve a percentage of volume that matches the market in the stock. So if the program traders can increase the volume on an individual stock just enough, they will trigger even more algo buying or selling. Program traders profit by having an option on the market. Their objective is to push that option into the money by a greater amount than what they used to get the market moving. Our conclusion is that the prices of currencies, commodities, and equities must be set by fundamental analysis. Criteria such as supply, demand, quality of the underlying asset must be the issues at the core of the price discovery process. The allures of �Computerized Trading� such as liquidity and volume are destroying the fabric of capitalism by creating a centrally controlled market place. The alternative is that every country must strive to secure its own farms for its own food security. The market has become a facade. NYSE, Nasdaq Plan to End Market Maker Stub Quotes Blamed in May 6 Crash"
HUGE: First High Frequency Trading Firm Is Fined For Quote Stuffing And Manipulation"